The 9th Doctor and Rose speed through space-time, chasing an odd, threat-level-mauve metallic object through the vortex. They follow it to London in 1941 and arrive at the height of the London Blitz. Here, they obviously split up. Rose meets the dashing Captain Jack Harkness, a former Time Agent from the 51st century who, it turns out, brought the mauve object there in the place in order to sell it to her and Doc. And The Doctor goes to investigate what’s going on, but finds more than he bargained for when he encounters a bunch of homeless orphans lead by a girl named Nancy, who are being stalked by a creepy, “empty” child in a gas mask. Are the two connected somehow? It’s up to The Doctor to find out in this first part of a double feature that also includes N010 The Doctor Dances. Beautifully framed horror shot. That's Nancy in the background btw. Someone explain to me how the kid is manipulating this monkey! ,,, AND then turn on the freaking lights and attempt a snog! What?! Teachers Ian and Barbara follow Wunderkind pupil Susan to a junkyard, where they meet her grandfather, The Doctor. To date, I’ve only been reviewing Hartnell episodes, but I wanted to make sure I got in a review for this particular two parter. Mostly because I had a personal story about when I was first getting into Doctor Who I wanted to share. Moving on, in this tale, the Doctor learns that Blitzkrieg London is perhaps not the best place to ask if something has fallen from the sky. The mystery dials are cranked up high and quick as both Rose and the Doctor have encounters with strange individuals. Rose and the boy in the gas mask, the Doctor and the disappearing girl. Rose also meets the one, the only, the omnisexual Captain Jack Harkness, whose first words “Excellent bottom” as he stares at Rose through high tech binoculars tell you everything you need to know about him in mere seconds. 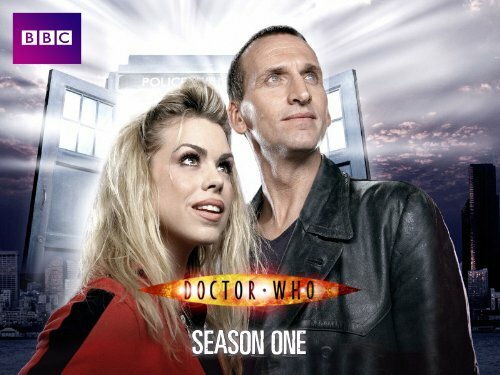 I liked that the Doctor and Rose are separated very early on and both find their own ways to investigate the mystery. Amusingly, Rose gets to do all the ‘Spock’ stuff she wants alongside Jack, learning just what they were chasing. Meanwhile the Doctor is doing classic detective legwork befriending the locals and finding where their goal is actually located. The creepy levels are maxed out as quickly as the mystery levels. The “Empty Child” and the constant asking for Mummy hits one a few different ways. A lost child looking for his mother is already one of the most potent emotional buttons that can be pressed. Put that in combination of the gloomy atmosphere and the faceless look the Child has with the gas mask and it’s easy to see why the Empty Child is among the creepier creatures in modern Doctor Who. Much like Captain Jack, you learn a lot about the Doctor when, faced with this potential abomination to all things living, the Doctor’s first impulse is to sit down and try to talk to and empathize with it. The CGI when Dr. Constantine transformed was a bit too obvious for my liking. I’ve said before I’m forgiving about special effects with Classic episodes. I’m a bit less so with modern effects. That’s mostly because I tend to look at old sci-fi special effects with the knowledge that at some point they were really cutting edge. Even if they weren’t, I take the view that “if they weren’t bad then how good would they be now?” To a point that does also apply here as there is a generally strong difference in effects from Eccleston’s era, when new Who was starting out, to Matt Smith’s, when it’s much more popular and presumably getting a bit more budget. That said, while I wasn’t a fan of the transformation in general, the point where the eyes but out into gas mask lenses was suitably freaky, in part because of the obvious CGI effect. For rating, I’m giving “The Empty Child” a 4.1. Like any good two parter it sets up a compelling mystery to be resolved in part two. While a serious episode, I liked the humor that got mixed in (the universal mauve alerts, the Doctor popping up in the middle of the dinner thievery, much of Captain Jack in general). It loses some points for the CGI effects but not enough to really hurt its rating. From the first international fan :-) Yes, I’m still there. The phone rings for the first time and Rose is hanging from a zeppelin right in the middle of the London blitz. Eccleston is fantastic. And we see Jack for the first time. needs more depth. This show is freaking scary and I’m note sure if this is suitable for children. The production values are top notch.